Sean Abbott was applauded by spectators as he took the ball in the 13th over of the day. 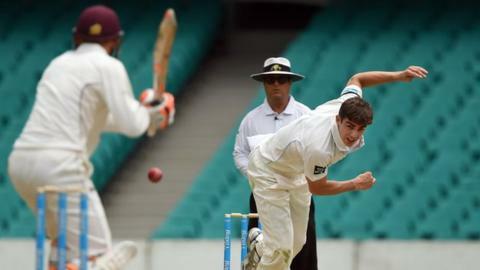 Australian cricketer Sean Abbott took two wickets and bowled a bouncer as he played his first match since delivering the short-pitched ball that led to the death of Test batsman Phillip Hughes. The bouncer came in the 22-year-old's first over on day one of a four-day state match against Queensland at the Sydney Cricket Ground. It is the same venue at which the 25-year-old Hughes was fatally injured. Abbott took the wickets of Nathan Reardon and Ben Cutting as he recorded figures of 2-53. Abbott was applauded by spectators when he was asked to bowl in the 13th over. He sent down a bouncer with his fifth ball and ended the day with two wickets for 53 runs for New South Wales, dismissing Nathan Reardon and Ben Cutting as Queensland were bowled out for 268. The NSW players wore black armbands for the game and also had "PJH 707" stitched onto their shirts, marking the fact that Hughes was the 707th player to represent the state team. Hughes was struck on the neck by a short-pitched ball from Abbott on 25 November. The left-hander collapsed on the pitch and died in hospital two days later. Abbott has received widespread support since the incident, including counselling from governing body Cricket Australia. Before the game against Queensland, NSW captain Moises Henriques said they were doing all they could to help Abbott through this difficult time. "From our point of view, we are trying to expel his name from the tragedy a little bit," said Henriques. "I don't think he was any more at fault than any fast bowler who has ever bowled a bouncer in his career." The Australian national team is also playing its first match since the tragedy, in the delayed Test series against India at Adelaide.